I flew Saudia First Class with Ben from One Mile at a Time last week from Dubai to Los Angeles via Riyadh and Jeddah. While many parts of the in-flight and ground experience impressed me, one thing impressed me most of all. His name was Chef Rahmi. Our Turkish-born chef on the 16hr Jeddah to Los Angeles leg was the superlative of all the onboard chefs I have ever encountered on any airline. Let’s start with his warm introduction. He came around to each seat, introduced himself, and offered to explain the menu, stressing that he was at our disposal to customize any dish on the (extensive) menu. I mentioned I loved berries and he somehow rustled up some strawberries and raspberries for me. After a six-hour nap, I was a bit hungry. Rahmi suggested that he could make me some pizza…from scratch. The only thing even better? A hot brownie with vanilla ice cream after. 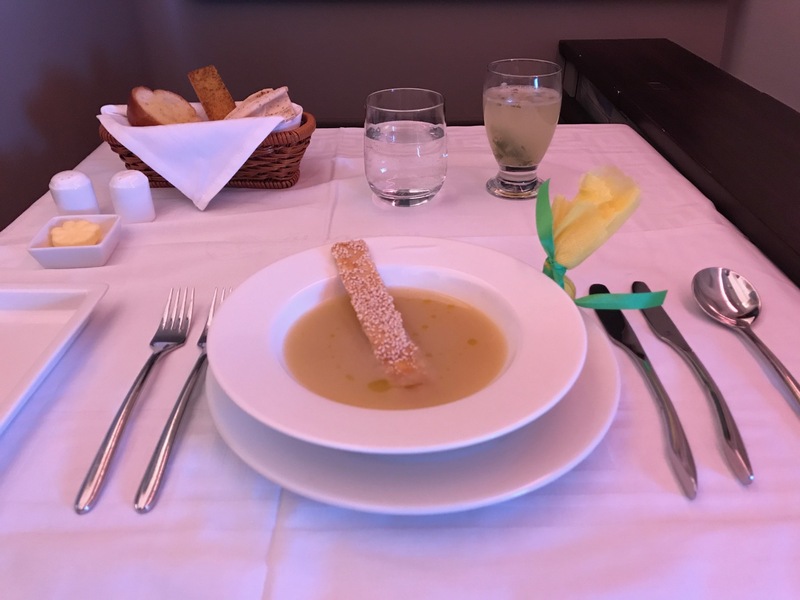 My “feast” began two hours prior to landing and included a delicious bowl of soup, caviar, Arabic mezze, a green salad, a delicious main course of lamb shank with pasta, and delectable desserts. Both the taste and culinary presentation were tremendous. Oh, I forgot the canapés. Rahmi made these himself — I watched him. These were not on the menu nor was he following a Saudia recipe book. This was his own creation and underscores how he went above and beyond to make the flight special. Saudia is a dry airline, but give me unlimited fresh pressed juices, smoothies, and cappuccino and I’m quite happy. and the rest of the first class crew — three wonderful Filipino FAs — was amazing as well. The Dubai to Riyadh flight was comical in terms of the poor service. I was bracing for the worst from Jeddah to LA but the flight turned out to greatly exceed expectations. Stay tuned for the full trip report with high(er) resolution photos. I admit the presentation DOES look nice even to a non-foodie like myself. However, the hard product does not look as good as Apartment Class on EY. Moreover, as far as service goes, maybe you just won the onboard chef and FA roulette? You need a wider sample base to know for sure. I’ve also been reconsidering my dry airline stance in the wake of Lucky’s recent post. Perhaps I would feel differently if I traveled as much as you guys. At BEST, however, I get to fly twice per year. So, when I do, and given a choice between otherwise similar and comparably priced products, I’d prefer the one that doesn’t have a built-in speed governor limiting my options. There’s no question that the Etihad Apartments offer a better hard product. Seat is better than QR and on par with EK. The bar onboard EK and QR is great…really a fun thing and I can understand why that might be a deciding factor. But I had a much better experience on Saudia then both EK and EY in F (with the exception of my LHR-AUH EY flight last year…). Man I’d fly this any day of the week even if there’s no alcohol. It seems that skytrax judgment of the most improved airline is justified. And some people might regret not to include Saudia on their current smear campaign…. This must be the most hilarious fake comment I’ve ever seen! I appreciate her comment, if real. 1- A crown prince is second in line to the throne and is obviously only one person. 2- “Mayyallah Muqqadim” is not an Arabic name and certainly not a Saudi one, it’s more Pakistani or Indian. 3- King Abdullah doesn’t have a daughter called Mayyallah. 4- That Twitter account is also fake, in it she calls herself “Sheikha”, whatever happened to “Crown princess”? 5- Hamdan Bin Rashid is Married to Shaima Alkhalifa, He’s Emirati, the fake account is supposedly Saudi. 6- You would expect a former King’s daughter to speak better English than that. 7-Saudia airlines is owned by the state, not by people. I can keep going on but it’s just too easy. I’m also a Saudi citizen by the way, in case you were wondering. Forgot to mention that Sheikh and Sheikha in Saudi Arabia aren’t used to refer to members of the ruling family, they’re used in the UAE and Qatar for that purpose. In Saudi Arabia a Sheikh/Sheikha is a general term used to refer to just about anyone who is respectable. I can keep going on forever but I really will stop now. Anyway, glad you enjoyed your trip. Hi Princess ,I had been working for the air lines as a hostess for 6 years. Beautiful memories and very educational.. Stay blessed..regards..Farwah..
Mr. Matthew, Thank you for this review. So… are you the chef? Yes, he is. I’m glad he found this post. I’m a First Class cabin crew with Saudia and this post by you about your experience flying with the airline I work for is very motivating for all the people who work hard to achieve guest satisfaction on board. I’m glad you liked the onboard service from JED-LAX. Talking about RUH-DXB, it’s not a long flight unfortunately and so affects the inflight service. But I hope your comfort was not compromised on and the staff and crew kept up to your expectations. Hope to see you in one of my flights someday Sir. Mr Aziz or Mrs Aziz. You are correct king Abdullah does not have a daughter named Mayyallah my name is Mayaalla-MuQaddim . MuQaddim is Arabic it means the one who expedites,one who brings forth it’s one of Allah 99 names. This number plus a lot equal the number of the king Abdullah army. Mayaalla MuQaddim was the name given by Allah for me. The meaning behind my name is simply: The girl who is a son that will Expedite the will of Allah … That I’ve been doing my whole life. For Allah I live. I will never lie for people. Thanks for flying. Matthew it’s very clear the this Aziz person . Follows me . Now the Twitter account noted as Sheikh then Sheikha given respect to my husband in the Middle East the husband name always comes before the wife. Sheikh means Prince or leader in Arabic . Sheikha means Princess. Another title given at birth. Crown Prince and Crown Princess are both title we were given at birth. Although I was given the title again in marriage to my husband. Like the Prince William we are given alot of titles in birth and in marriage. But you can look this up when ever you have time. And the Airline my uncle gave to me this year. My staff are the best at what they do. The quality of service speaks for that. They are the best. How delusional are you? I’m concerned that someone like you is at large rather than being in a psychiatric institute. May Allah help you with your facts as two other people lives. With that said I do have a life. So, I am very sorry with my delay to your statement. My uncle turned over the Airline to my care. I will care and insure the staff are very well taken care .We would like to have more flights and employe more people to improve the wellbeing of the country as well as the airline. this one of the programs for 2030. Good customer service does not only work in the private section but also in the governmental sections as well. Saudi a airline the represent our country as well as our People. as we open our door for tourist to visit we also open the door to our culture and people. if our people are not provided for we can not effectively provide for our guest . So… Yes I will continue to be proud of my staff and provide the best working environment. thank you Matthew we look forward to seeing you again.